Odd Time Meltdown II | Odd Time Drum Loops and Samples for Rock, Fusion, and More. 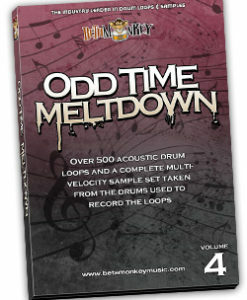 Beta Monkey Music's Odd Time Meltdown II features odd meter drum loops in 3/4, 5/4, 7/4, 7/8. Get your groove on in 5, 7, 9, and beyond, Odd Time Meltdown II will take your music beyond common time. Features over 350 powerful and tasteful acoustic grooves captured in one of Los Angeles' premier recording rooms. Break out of the 4/4 rut! Covers grooves in 3/4, 5/4, 5/8, 7/4 and 7/8 time signatures. Compatible with all L.A. Essentials Sessions. For Rock, Prog-Rock, and Fusion. Odd Time Meltdown IV is exclusively odd time drum loops in 3/4, 5/4, 7/4, and 7/8. With an intense uptempo rock attitude, it's time to push the energy of your tracks with musical interpretations of four different time signatures. Spanning 100 bpm, 125 bpm, and 150 bpm, Odd Time Meltdown IV delivers eight complete songwriting folders, including loops, fills, and multi-velocity drum samples.